Each year, we gather to celebrate the people, places and institutions that make our community special. We give anniversary accolades to Milwaukee organizations and companies celebrating 50, 75, 100, 125, 150 and 175 years in business. We also recognize some special individuals who have been a special part of creating the Milwaukee we know today. Join us in celebration. Tickets are $75 each for Members, or $85 non-members. 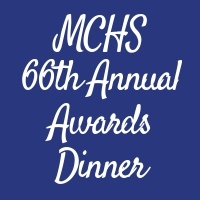 For more information about the event and this year’s honorees, visit our Awards Dinner web page. If you have any dietary restrictions, please contact Morgan Sweet at 414-273-8288 x. 19 or morgan@milwaukeehistory.net. Thursday, April 11, 5-8 p.m. There is no better place to have an Old Fashioned than Milwaukee, and why not do so while enjoying the Milwaukee County Historical Society’s 2019 feature exhibit, How Dry I Am: Prohibition Milwaukee. 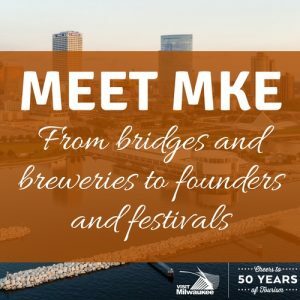 Your night is complete with free admission to the Society, a chance to see drink demonstrations by Bittercube, maker of local Milwaukee bitters, and listen to tunes of the time with WMSE. Join us from 5-8 p.m. and start your evening off right! Tuesday, April 16, 10 a.m. to 3 p.m.
Tis’ the time of year where we open up our historic sites for the season. Join us at Trimborn Farm as we get the site ready for a summer of fun: education programs, field trips and our Harvest of Arts & Crafts. Any amount of time on that day is appreciated – RSVP to mjknapp@milwaukeehistory.net to let us know you are coming! Friday, June 14, 6:30 to 8:30 p.m.
An “Evening Fit for a Baron” is what you will find at the 2019 Summer Wine Tasting at the Pabst Mansion. Brought to you by the Pabst Mansion and the Milwaukee County Historical Society, together with Ruby Tap, expect a tasting of 55 wines, light appetizers, music filling the halls and grand terrace, and a chance to experience the Pabst Mansion in a new and exclusive way. $50 for non-members, $40 for members of the Pabst Mansion, Milwaukee County Historical Society, or Ruby Tap Wine Club Members. How Dry I Am: Prohibition Milwaukee, the Milwaukee County Historical Society’s 2019 feature exhibit, explores Milwaukee during the Prohibition era (1919-1933). How did nationwide Prohibition happen? How did people and businesses face this tumultuous period? What social and cultural shifts occurred? And how did these times impact Milwaukee and the nation? Explore this pivotal time in our history through historic images, audio and visual media, and interactive experiences. Meet MKE is the newest permanent exhibit at the Milwaukee County Historical Society. Showcasing some of the most iconic artifacts in the collection, this exhibit explore Milwaukee history from bridges and breweries to founders and festivals. 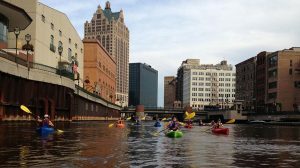 Explore Milwaukee and its history as you paddle down the Milwaukee River. Learn about Milwaukee, past and present, from the viewpoint of the Milwaukee River led by guides from the Milwaukee County Historical Society. These tours are offered each year from May through September and reservations are required. Group outings can also be arranged. Children age 12 and older can participate with just one chaperone per 10 students. Please call for information for trips with children ages 11 and under. 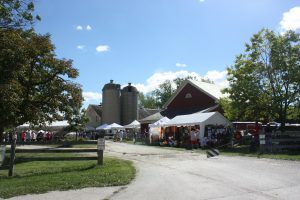 Please go to www.trimbornfarm.com for exhibitor applications and more information about this annual event.